Last night when I left work it was particularly hot outside. I was so hungry for something healthy and tasty, and given that it wasn’t the best weather to ‘cook’, I decided on a nice salad with some of my left over Lemon and Chive Veal Schnitzels I had in the freezer. 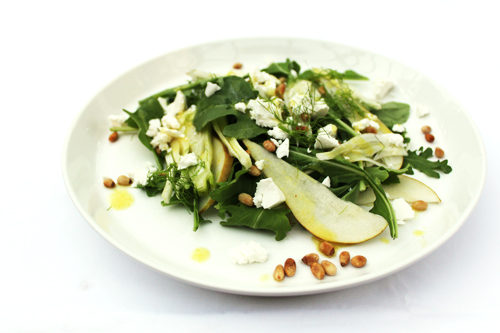 The Rocket, Pear and Pine Nut salad is my ultimate salad! There are a few variations out there, but I like mine with fennel and feta. You could also use avocado and or walnuts, or turn it into a meal by adding shredded poached chicken. The best thing about making these gourmet salads is not only the taste, but you feel like you’ve made something special, and that it’s not just another salad. I used apple cider vinegar dressing, which works really well with the fruitiness of the pear. When I was in Italy my Zia Emma used apple cider vinegar in all her salads, and my gosh it was just such a lovely change from the normal red wine vinegar or balsamic I used. When I got back to Perth I went to the shops and bought a bottle, and haven’t stopped using it since. Feel free to use whatever dressing you like – lemon juice instead of vinegar works well too. In a bowl or large plate, place the rocket, pear and fennel, and toss lightly. Crumble over the feta and sprinkle the pine nuts. In a jar, add the dressing ingredients, close tightly with the lid, then shake. Add as little or much of the dressing as you like.